The Gateway Editor is a small app that allows you to add, remove, and modify the servers listed in the Gateways dropdown menu. If you’re using an original Warcraft II: Battle.net Edition CD or a pirated Warcraft II .ISO then you will need to add server.war2.ru to the list in order to play on our server. 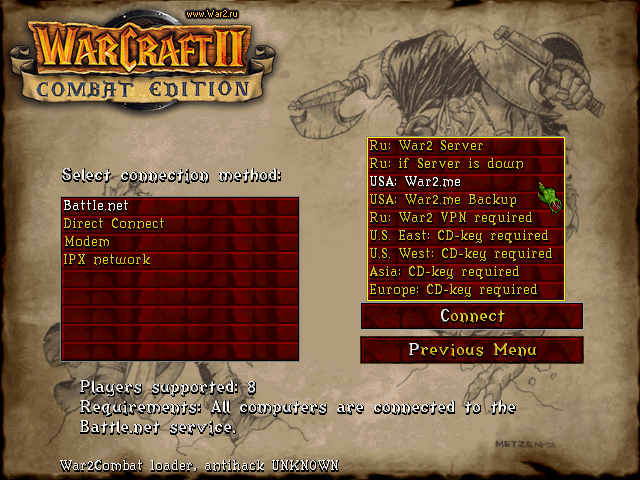 An easier alternative is to download and run this registry file — simply download, double click the file and click yes for all the prompts, and the gateways for War2.ru & War2.me will automatically be added to Warcraft II. Double click the BNGatewayEditor icon, it will open the window pictured below. Click “OK”, then exit the Gateway Editor. If Warcraft II is running, close and restart it. You’re done! 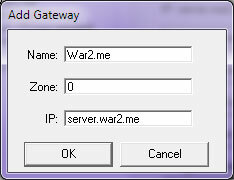 Server.war2.ru & optionally server.war2.me will now be in the gateways list! You can optionally add backup.war2.ru and backup.war2.me to have access to our backup servers in the event that the main server goes offline.